Hey beach babes! So I thought a fun fashion post was long overdue. As much as I'm really enjoying branching out with blogging and talking about a whole range of topics, fashion will remain the heart of this blog amid all the upcoming subject matters I want to discuss with you too. I've got lots of outfit posts to share, so hopefully there'll still be a mix of content here for everyone. It's been lovely getting such a positive reaction from my last few posts, especially "what to do when friendships f*ck up", and "how to gain confidence when your self-esteem is at rock bottom". It''s given me the courage to keep talking freely and openly about a wide range of issues that I've experienced. If my bad times and experiences can become good outlets for advice and tips to help my readers then I'm living for that. 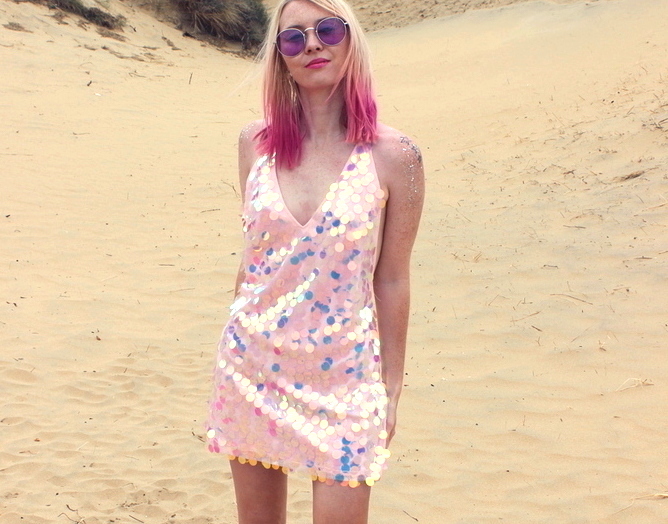 I snapped up this uniorn disc sequin dress from Motel Rocks earlier in the year which I'm totally starry-eyed for. 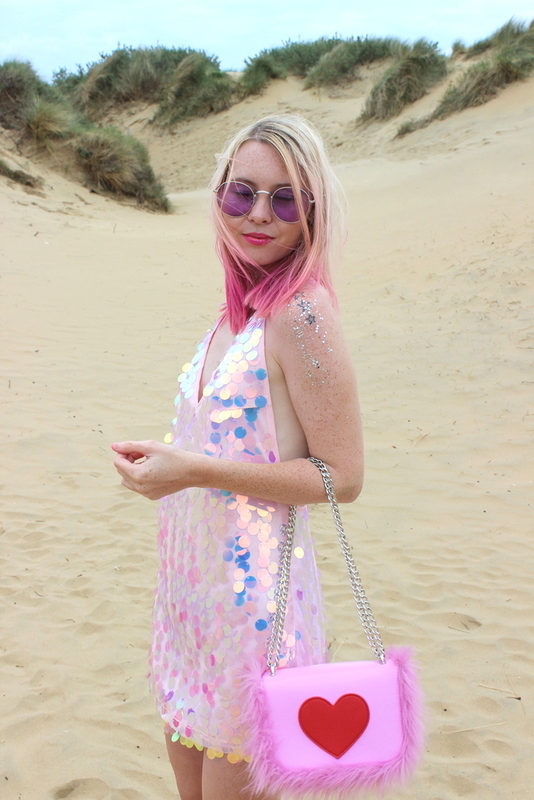 As always the sequin dresses and festival fashion pieces on the Motel Rocks site are pure magic to me, but a potion of poison for my bank account. I'm desperate to get my hands on more dazzling designs of theirs but $$$. 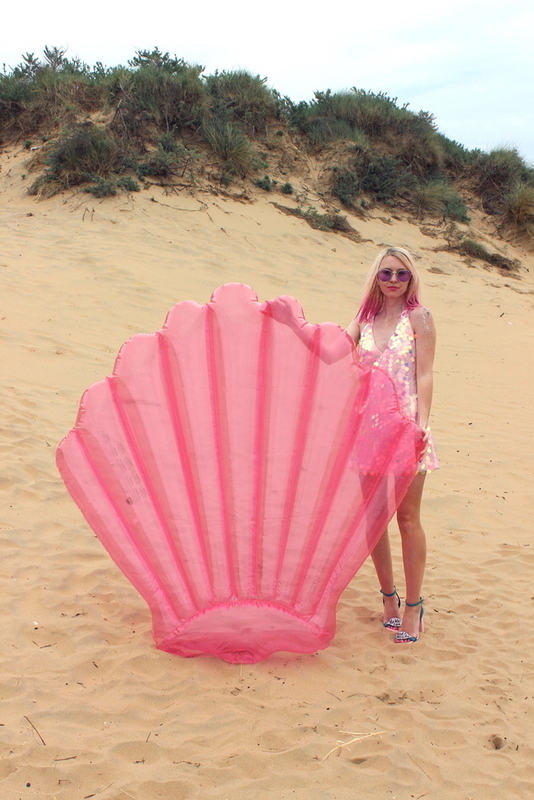 I found this sparkly sequin dress for half price on eBay (bonus) and immediately knew it would work perfectly with this ultra cute pink seashell pool float from BigMouth. I've got quite a pool float collection, but there's deffo something extra sassy about this one. 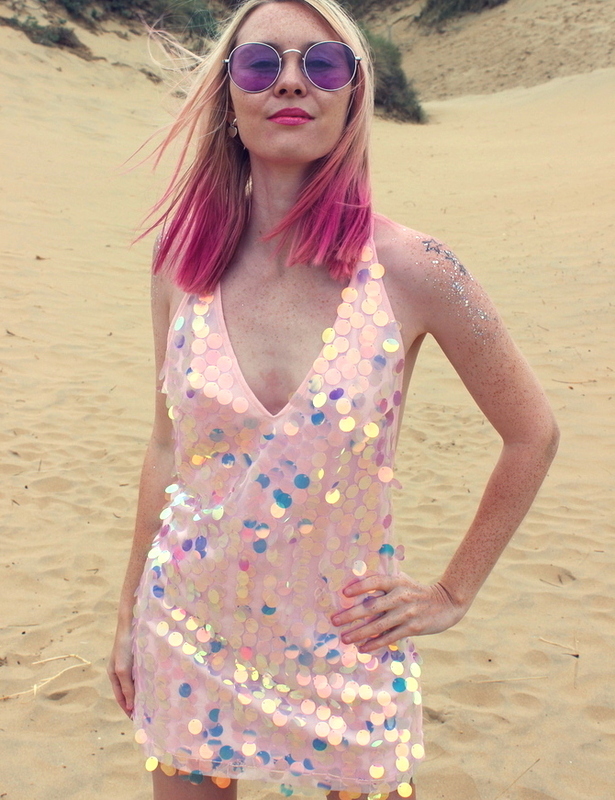 For this shoot I had fun with festival vibes using Go Get Glitter sparkle; I was lucky enough to win a competition of theirs over on Instagram and was thrilled to receive some of their sparkly glitters which worked perfectly with my sequin dress. I kept the glitter on my shoulders after the shoot and later on our Starbucks barista complimented me on it which was lovely. 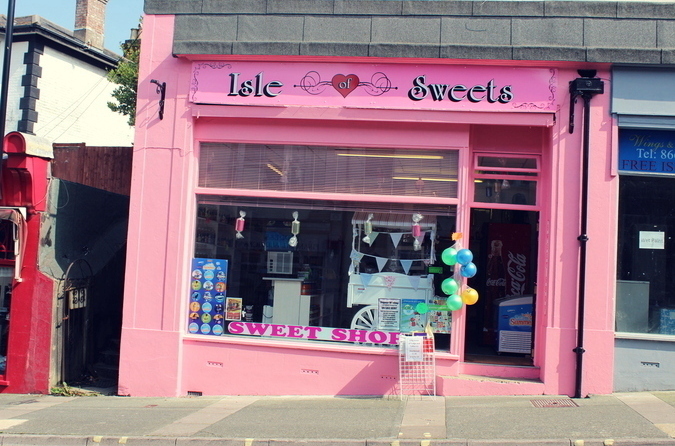 The fluffy pink bag is from Skinnydip London, one of my favourite bags from them so far. I'm a little heartbroken to say that their latest bags aren't giving me all the feels. I'm just not loving their new releases as much as usual. They just don't seem as original, as sassy or as stand-out as they normally are. Just me? I really hope they gift us with some gorgeous badass bags soon, I've got a voucher to spend and am dying for a new addition to my bag collection. Come on Skinnydip, wow us! Add in my talkative "He was like....and I was like..." slogan heels and purple shades and this outfit was good to go! Mama and I had fun shooting these blissful beach pics. Hilarity ensued as the shell floaty wouldn't pose properly and kept blowing away; I spent most of the shoot chasing the bloody thing up the sand dunes. Even though it was a warm day the beach was totally deserted meaning we got these photos in gorgeous peace. Afterwards we went for cups of tea and read our books. Honestly, just being at the beach is cloud nine closure to me. My idea of a perfect day for SURE. Have you got any beach trips planned this summer? 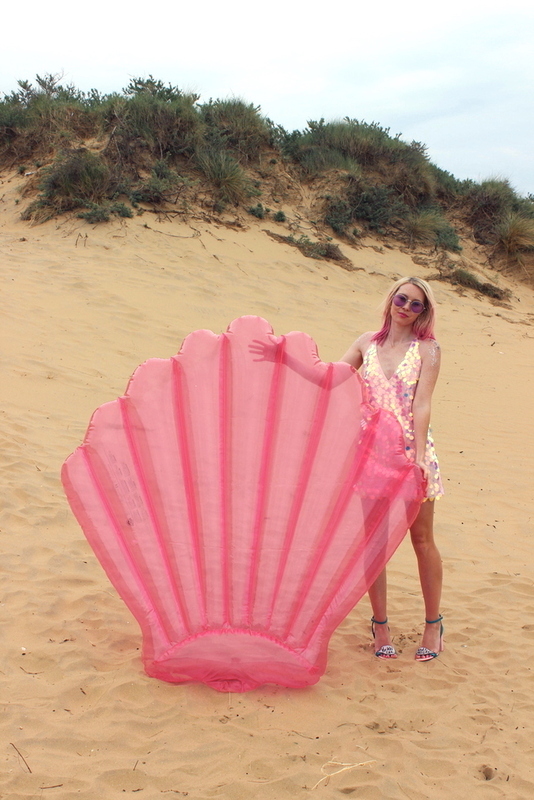 Are you a fan of sequins on the beach? I love your beautiful fun style Sophie, it always makes me happy how you get out there and add sparkle to your outfit. Wether it be with glitter, your cool floats or your personality, your inner soul shines bright. I'm sure you inspire not only me but so many girls with your personality and by sharing your life experiences with the world. You look magnificent babe!! Such a fantastic dress and that bag is so cute! You look super beautiful and these photos are stunning! Lovely post and i like you dress. Omg!!! This outfit is so so perfect. I love your dress and the bag and just everything!! I love this sequin dress. It looks fabulous on you and goes well with your skin tone. I absolutely love your sequin dress on the beach. I used to wear sequin clothing almost every day because I love to sparkle and shine. Nowadays I got more into black and white clothing. But Fashion is so fun and cool thank you for reminding me on trying out more different things again. The first thing that came to my head when I saw your photo is "she looks like a mermaid". Your outfit is just on point! Good to hear that fashion will still remain the heart of this blog because I love your style. Gotta love sequin, so radiantly beautiful on the beach Sophie.The dress is incredible and suits you perfect. Your sequin dress is so fun, as is the giant pool float, but I'm mostly just impressed at the heels on the beach, haha! I know it was just for the photo shoot but I'm in awe you were able to stand on sand in them! Hope that you are having a wonderful weekend! It's really cold here and one of the boys is unwell so it will be another quiet one for us!